As Safir Newspaper reported that Lebanese President Michel Suleiman will participate in the inauguration ceremony of Iran’s president elect , Sheikh Hassan Rouhani. Suleiman will reportedly pay a short visit to Tehran on August 3, at the head of a small official delegation which will include caretaker Deputy Prime Minister Samir Mokbel and Foreign Minister Adnan Mansour. While in Tehran , Suleiman plans to meet the Iranian Supreme leader Ayatollah Ali Khamenei, and a number of heads of delegations that will be participating in the inauguration ceremony. Suleiman, who is currently in Washington on a private visit to undergo some medical exams is expected to return to Lebanon this Sunday . In a somewhat interesting development Iran’s foreign ministry said that the United States and Israel have not been invited to attend the Aug. 4 inauguration of the country’s president-elect. Spokesman Abbas Araghchi told a press conference Tuesday that leaders from all other countries, including Britain, have been invited to the swearing-in of Rouhani. Araghchi had said on Sunday that all world leaders have been invited to the event, but his remarks Tuesday clarified that U.S. and Israeli leaders are not on the list. Rouhani has pledged to follow a “path of moderation.” He also promised greater openness over the country’s nuclear program, which has placed Iran at odds with the West. Rouhani, who will have limited authority as a president won a landslide victory in June 14 presidential elections. He replaces outgoing President Mahmoud Ahmadinejad. Khamenei is the country’s unelected de facto ruler under the Wilayat al-Faqih ( the rule of Islamic jurisprudence) Iranian system . According to Iranian constitution the Supreme Leader asserts the authority of the president. 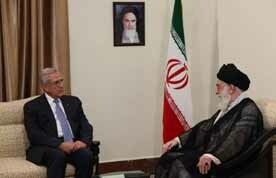 Photo: Lebanese President Michel Suleiman in a file photo with Iranian Supreme leader Ayatollah Ali Khamenei. Suleiman will participate in the inauguration ceremony of Iran’s new president, Sheikh Hassan Rouhani scheduled for Aug 4. Strange perhaps, that the wonderful American University Hospital in Beirut couldn’t test Suleiman. I am the president monsieur, are you kidding me, I do not trust Lebanese hospital !